To some, it is a party that speaks up for the people, challenging Germany's pro-European political establishment, and tackling tough issues which other parties are afraid to mention. To others, Alternative fuer Deutschland (AfD) - or Alternative for Germany - is a dangerous populist force, whipping up anti-foreigner feeling, and giving right-wing extremist ideology a respectable face. Either way, few are indifferent to Germany's new anti-euro party. It was founded last year as a protest against German-backed EU bailouts for poorer Southern Europe. The AfD originally catered to some German taxpayers fed up with paying for what they saw as the irresponsible behaviour of southern Europeans living beyond their means. But it has now become the first anti-euro party to win seats in a German regional parliament, receiving almost 10% of the vote in the eastern German state of Saxony, taking even the party's bosses by surprise. "Astonishing results," Frauke Petry, one of the party's leaders, told journalists in Berlin on Monday. The 39-year-old mother-of-four is a former chemist. As the face of the party, she is meant to shake off its grumpy-old-man image, campaigning heavily on education and family issues. That agenda counters allegations that the AfD is simply a more respectable, lighter version of the far-right NPD, which is no longer represented in Saxony's parliament. But Ms Petry has big ambitions, giving a clear warning to Chancellor Angela Merkel's governing Christian Democrats (CDU), who have ruled out entering into government with the AfD - both in Saxony now, and nationally in the future. "The CDU will lose out if they refuse to talk to us," she said. The danger for Angela Merkel is not that the AfD poses a threat as a rival for national or even regional government. Rather it is that Germany's right will be splintered - much as, over the past decade, the far-left Linke party has chipped away at support for the centre-left Social Democrats (SPD). By focusing on traditional conservative ideas, such as law and order, tougher border controls, and the importance of the traditional family model, the AfD is managing now to attract voters who feel that Mrs Merkel's government is betraying those values. Mrs Merkel's pragmatic approach, to appeal to as many voters as possible, has pulled her CDU party closer to the centre. And governing with the SPD means compromise. So the AfD aims to scoop up voters who want a tougher approach to the EU and immigration - much as the Eurosceptic party UKIP does in Britain. In Britain, UKIP can make statements about Europe which in pro-EU Germany would lead to pariah status. However, in Germany, comments by some AfD candidates on abortion or homosexuality would be deemed unacceptable in mainstream British society. 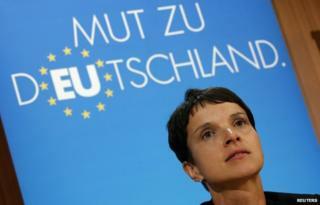 And AfD leaders bristle if they are described as Eurosceptic, keen to underline they are anti-euro, not anti-EU. So, in the European Parliament, the AfD is actually in the same grouping as the UK Conservatives, not with UKIP. Commentators often see more parallels between the AfD and the socially conservative American Tea Party, than with UKIP. "We have arrived on the political scene," announced AfD leader and co-founder Bernd Lucke, an economist who has taken time off from his career as university professor to campaign for Germany to leave the euro. The party narrowly missed getting into the national parliament last September, but did get into the European Parliament in May. So the result in Saxony is being seen as proof that the AfD can play a role in German domestic politics, and not just campaign on EU issues. But there may be a limit to how far the AfD can go. Smaller parties in Germany, such as the Pirate Party and the free-market FDP, can rapidly become irrelevant. So Mr Lucke's confidence may be premature. This remains a small party well to the right of Germany's political mainstream. And the anti-euro message is controversial in Germany, traditionally a pro-European country. In addition, the AfD's more populist rhetoric is potentially toxic for mainstream parties, making future governing coalitions with the AfD unlikely. And other parties are aware that some former supporters of the far-right NPD in Saxony appear to have defected to the AfD. On 14 September the AfD will face its next test, in regional elections in the eastern German states of Brandenburg and Thuringia. Across eastern Germany as a whole, support for the AfD is running at about 8%. The results of these state elections will indicate if the AfD really is on the march.